Are you searching for information but don't want to do the typical type of search? You may want to give the app Q! Stay Qurious app a try as it searches through the "wisdom of the crowd" for a whole other take. As a user you are asked to provide your feedback all the time and the information that is provided is meant to cater to the interests of the masses. This also means the information changes depending on what people are looking for. When reading the iTunes description of this app I have to say it’s really quite a hard concept to grasp. It all seems so abstract. The app states that if there is a topic you are interested in you can find a URL that relates to it and then pose a question based on the information found there. This question then goes out to the other users, which is where it becomes a social search application. The developers are promising there are more tools and features to come in future updates so it will be interesting to see how they impact the app. In its most recent update there have been a number of bug fixes such as being able to properly use the circle notification, the social network icon is updated, and you can now copy text to the clipboard with ease. There is also the ability to include images when you are doing an interweb search. The app doesn't yet have a customer rating or customer comments. Launching the app I have to say I feel a bit leery as the description has really left me rather confused. You need to sign in through Twitter or Facebook in order to use the app, which is a bit disappointing. I think a good place to start with this app is the “Explore” section. 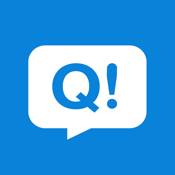 This gives you a chance to view questions that users are posing and give you an idea of how things work. You will see the question asked with or without an image, then you can see how many answers there are and tap on them to read them. You can even include an answer yourself. When you’re ready to pose your own question just tap on My Q! to write it. Go back here to view any questions you have asked and view the answers. The user interface is actually very streamlined and user-friendly. The Q! Stay Qurious app can be used on your iPod touch, iPad, and iPhone to pose questions to a social network. The user interface is simple and user-friendly and you may end up learning some really cool and interesting information.